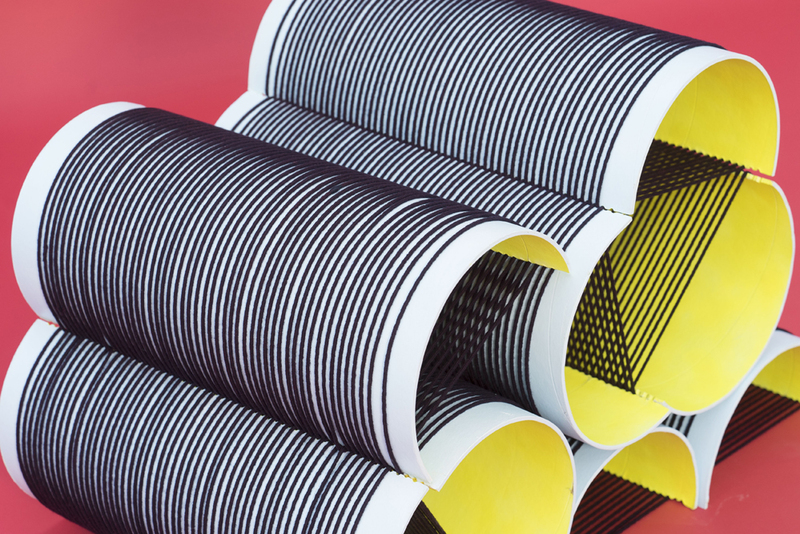 Flex: Exploring flexibility through solid and soft materials in woven structures, is a textile design collection by recent graduate Phyllis Hahn from the Swedish School of Textiles. 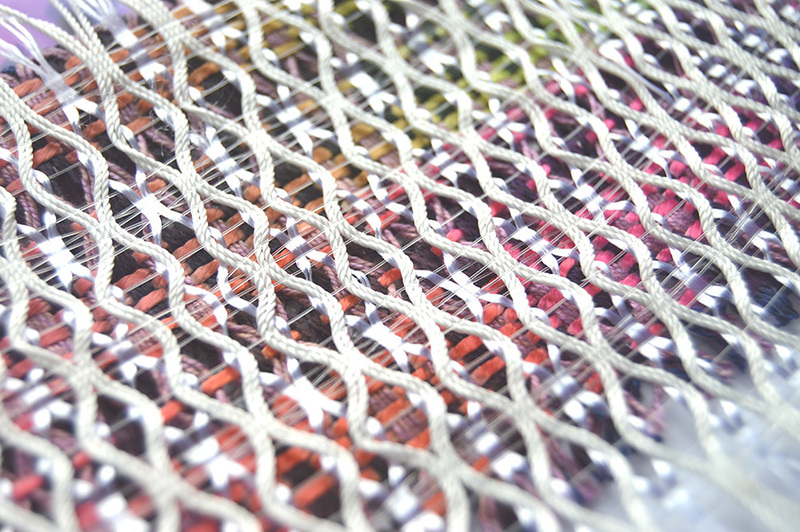 A work which challenges the traditional function and behaviour of woven textiles by exploring flexibility, scale and materials. 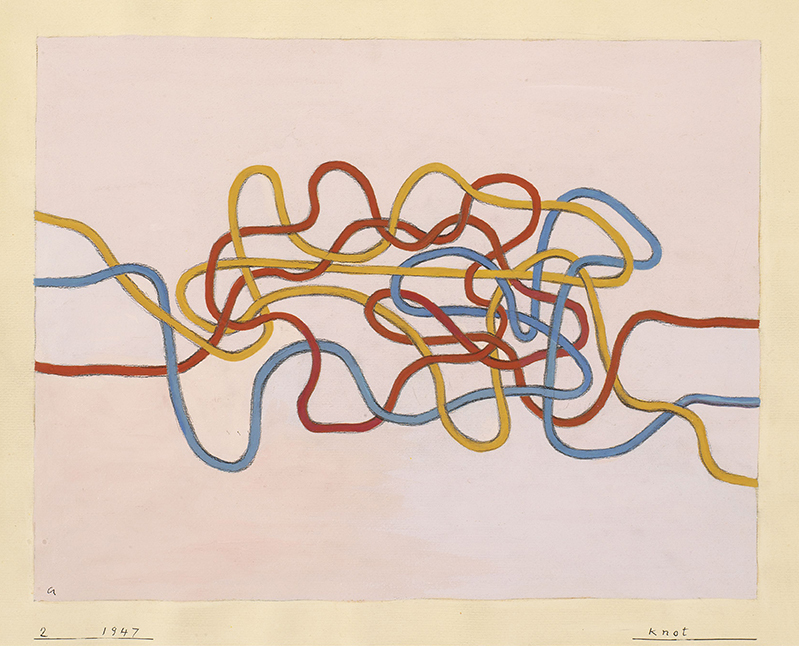 Her work started out with an interest in the border between textiles and furniture. 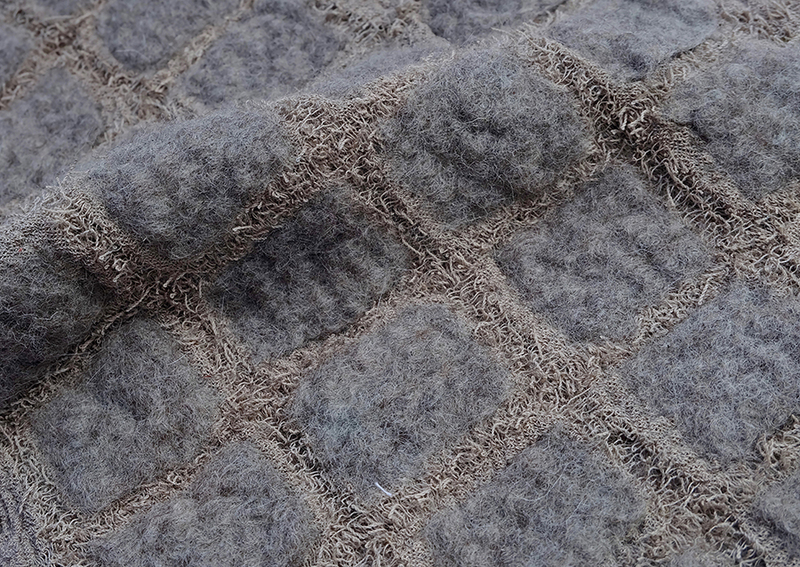 With a focus on the carpet, questions such as ’what is a carpet and when does its function change?’ pushed the work forward. 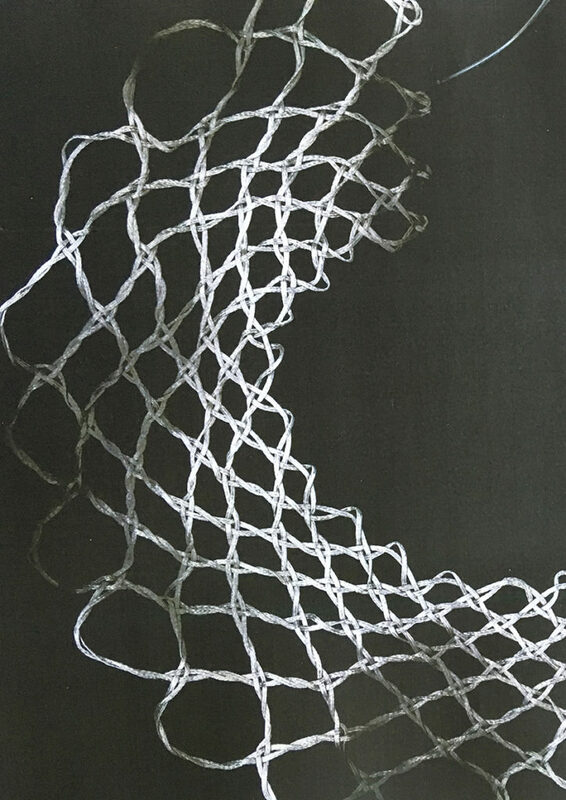 Eventually, this evolved into a exploration of flexibility within woven structures and by integrating solid materials such as wood and cardboard into the weaving process and combining those with pliable materials such as wool, polyester and cotton, she explores flexibility in the weave through materials and their opposite qualities. Humphries Weaving is a distinguished British manufacturer of custom Jacquard fabrics, gaining an international reputation for designing and weaving fine furnishings for historical restorations and the high end decorator market. They combine historical expertise and academic research with evolving weaving techniques to produce impeccable fabric design. Humphries pride themselves on having the imagination to deliver a client’s vision; their patience, knowledge and expertise of colour, design and woven construction guides them to create innovative contemporary textiles and accurate historic reproductions. Henrietta Johns is the winner of the new Tengri Textile Innovation Award 2018. Tengri, a luxury material innovator and pioneering fashion and lifestyle brand, announced the winners of its inaugural Tengri Innovation Award, launched this year to encourage the implementation of sustainable fashion and textiles working towards a more sustainable industry standard and future. The award was open to final-year students of the Tengri Innovation Partnership, an initiative which includes some of the UK’s most influential academic and creative institutions. Designers were invited to present innovative and sustainable approaches to textiles, to meet criteria set to demonstrate forward-thinking conceptualisation of sustainable fibres and practices that rework cultural and traditional techniques. Critically, these practices would be set to demonstrate the preservation of heritage in fabrication, construction and production. London design house Tengri, champions the use of rare fibres from endemic animals, including the yak, an ancient animal dating back 10,000 years, and a rare species of yak from the Khangai region of Mongolia unrecognised by the textile industry until Tengri’s launch in 2014. The studio is committed to referencing nature and natural reinvention to create a sustainable future, and working to commercialise heritage and traditional techniques as part of a sustainable production cycle in luxury fashion. Applicants of the Tengri Innovation Awards were not only invited to present proposals for the integration of sustainable fibres, but also how this would further be developed in their approach and techniques post-graduation. As winner of the Tengri Innovation Award, Henrietta receives a one-year mentorship with Tengri, as well as a six-month paid internship supported with Tengri Noble Yarns for production and a cash prize. 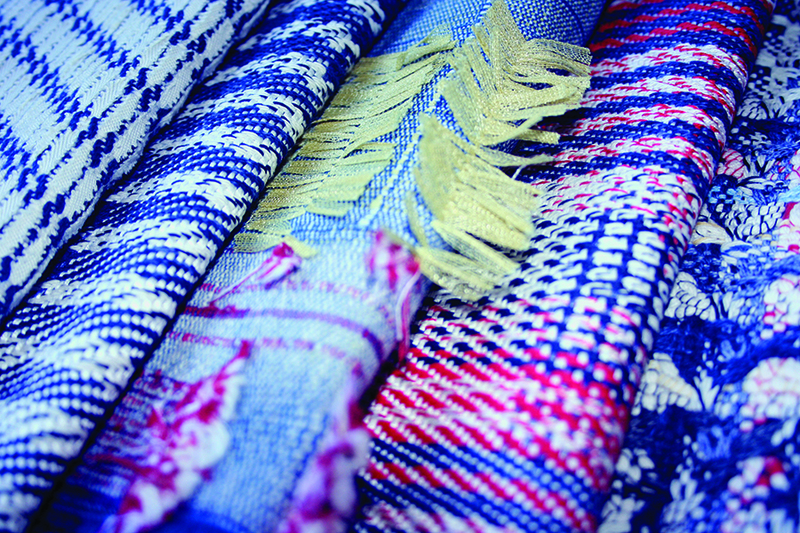 This September New York Textile Month takes over the City for its third year. As part of the month long celebration of fabric and making; Denim Days is returning for a weekend of all things Indigo. Norn Design is exhibiting at Denim Days with its new Denim Collection of samples and concept pieces. Look for Norn Design in the program for stand info. The Norn studio is tucked behind London’s only Craft Jean Factory: Blackhorse Lane Ateliers . 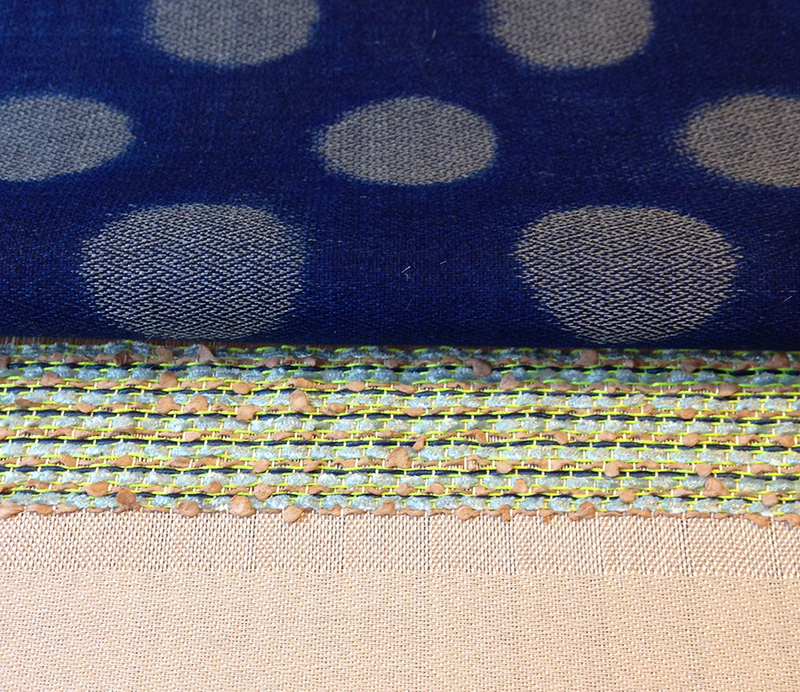 Infected by the hum of the denim factory, Norn began dreaming about the possibilities of handwoven denim. Starting with the basics, Indigo and Cotton, they have been expanding and challenging the notion of ‘Denim’ as a woven cloth. Through exploration of texture, structure, colour and hand weaving techniques we have developed a collection of Norn Denims. Fifteen designer makers are exhibiting their work in Bury Court Barn and its garden in October. The exhibitors, renowned practitioners in ceramics, wood, willow, jewellery and textiles will show pieces for sale or commission, and reveal their thinking, inspiration and working methods in practical demonstrations and illustrated talks during the exhibition. The stages of making – the consideration, the preparation and the sheer repetition of creating something by hand, all play an equal part in the finished object. 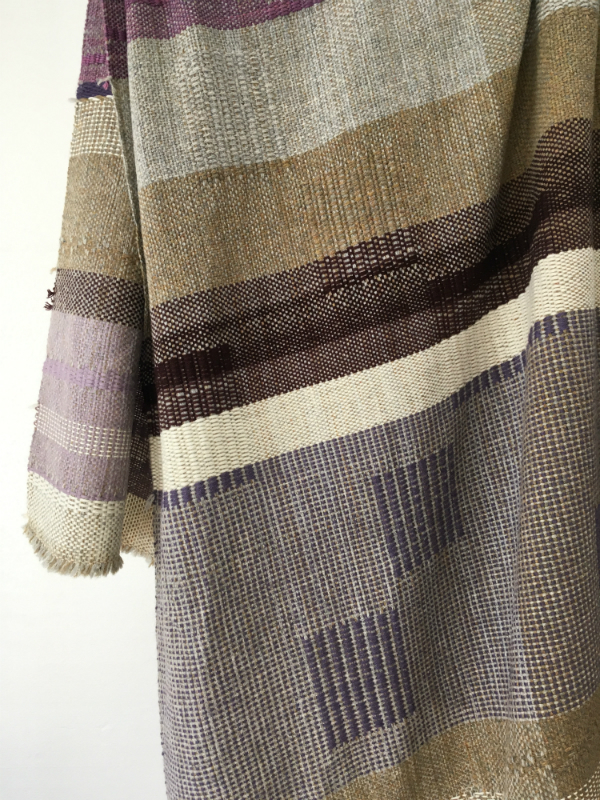 In celebration of the London Design Festival, textile artist and weaver Catarina Riccabona will be joining the series of ‘Makers’ Tales’ showcases in the Guy Goodfellow Collection showroom. Cartarina loves working with her hands. She enjoy the flexibility, the spontaneous changes and the direct contact with the materials that is possible when weaving by hand. She makes one-off interior pieces, mostly throws, and, more recently, wall hangings. Her textiles are often large compositions featuring areas of juxtaposed weave structures. Catarinas’ practice is based on environmental values. She works with a well-researched selection of yarns. She predominantly use natural (unbleached, undyed) linen in her warps. For the weft yarns she likes to work with linen, hemp, wool, alpaca and second-hand or recycled yarns. Her favourite supplier for plant-dyed wool is a woman in Finland who grows all the ingredients in her own garden and dyes small batches of local rare breed wool by hand. Every time her results differ slightly, and Catarina loves these subtle and unpredictable nuances. Recycled linen can be another source of colour and also Catarina buys it from a UK company that re-spins industrial surplus into new yarn. 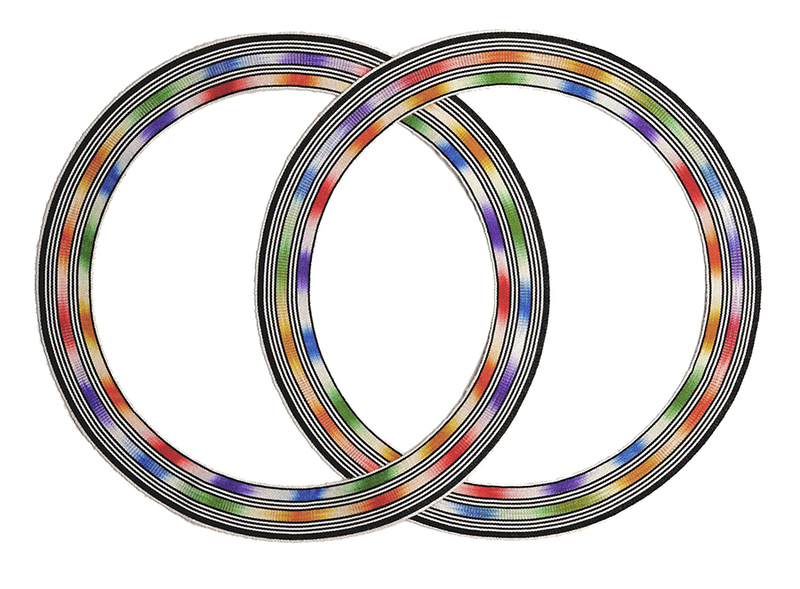 The colours are limited and depend on what is available at any given time. She enjoys this challenge of finding solutions within a set of limitations. Catarina also collect warp remnants from weave colleagues which she knots them back together to form a continuous string to be used in the weft. During weaving the little knots appear all over the cloth and form a distinct feature that is reminiscent of elements in tribal textiles from all over the world. This hand-made and natural character that is typical of tribal textiles has always had a strong appeal for her. ‘Makers’ Tales’ showcases invited artists and makers in a series of exhibitions designed to celebrate the fine traditions of artisan design and production. 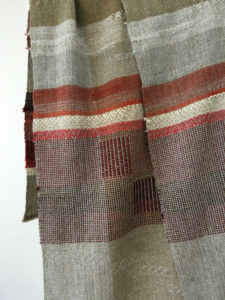 The latest showcase “Catarina Riccabona Hand-woven Textiles” is on from 17th September to 12th October. She will be at the GGC showroom on the 20th September for a “Meet the Maker” day to discuss her work and explain the ethos behind her practice. Laura graduated from the University of Huddersfield with a First Class BSc (Hons) degree in woven textiles. During her final year of study Laura was awarded winner of the Northern England heat and runner-up in the UK final of the Society of Dyers & Colourists International Design Competition. In addition to showcasing her final collection at New Designers she previously completed work placements at M&S Head Office, woven design studio Rare Thread and trend forecasting agencies Scarlet Opus, Colour Hive and Unique Style Platform after successfully being awarded a bursary by The Clothworkers Company. Her final collection combined innovative colour blending and traditional, technical leno hand weaving skills. Presented in a palette that ranged from fresh bright to deep dark tones, the set of sophisticated fabrics were directed towards the high end apparel market. 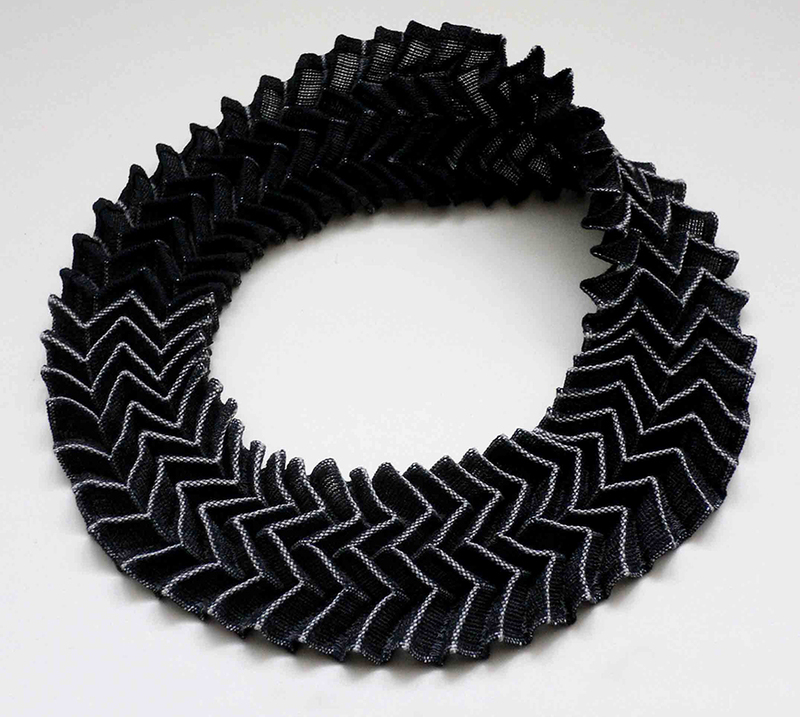 Hannah Robson is a textile artist, interested in the spatial qualities of textiles. She constructs sculptural pieces using combinations of weaving and lace-making, exploring how threads can escape the traditional vertical and horizontal pathways imposed by the loom. She creates opportunities for threads to break away from woven surfaces, taking alternative routes and joining together in three-dimensional forms. She exploits the tensions between rigorously controlled constructions and free-flowing loose threads, balancing structure and chaos. Open 10am-4pm Monday – Friday: 12-4pm Saturdays. Launched in the Spring of 2016, and now in their third year of business, The Aviary Studio make their debut in the Première Visions DESIGNS hall 5, stand no: 5SW46 this September 2018. The Aviary Studio is a UK based hand weaving studio and design consultancy founded by British designer and established weaver Sarah Podlesny, a Central Saint Martins alumni who has a clear vision to inspire, and to fill the constant demand for newness in an age where ‘copying’ has become standard practice. Fabric design is often overlooked in favour of the cut and style of a garment, wovens often overlooked in favour of print, and with this in mind, it is The Aviary Studio’s aim to put the spotlight back on wovens, celebrate their cultural importance, their versatility and the invaluable talent and craftsmanship of their makers.